Preheat oven to 350°. In a microwave, melt chocolate and butter; stir until smooth. In a large bowl, beat eggs and sugar on high speed 10 minutes. Stir in vanilla and chocolate mixture. Gradually stir in flour. Fold in cherries. Spread into a greased 13x9-in. baking pan. For topping, in a small bowl, beat cream cheese until smooth. Beat in mashed banana and preserves. Add egg; beat on low speed just until blended. 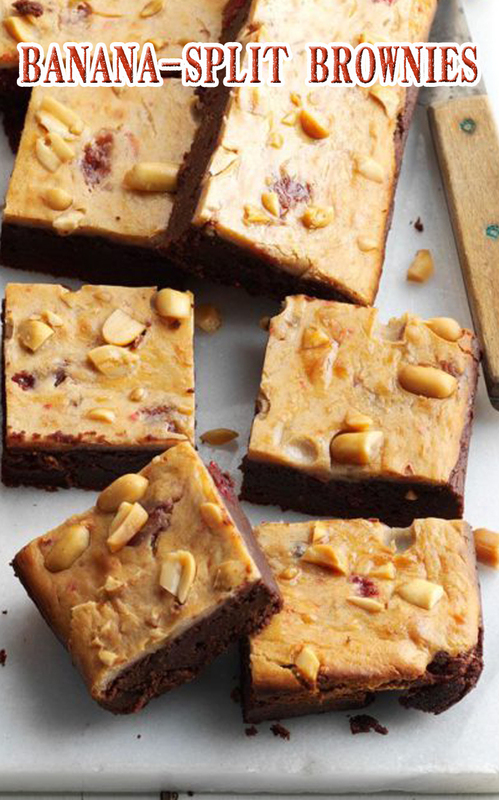 Spread over brownie batter; sprinkle with peanuts. Bake until topping is set and a toothpick inserted in brownie portion comes out mostly clean, 40-45 minutes. Cool completely on a wire rack. Cut into bars. If desired, serve bars topped with banana slices and additional cherries. Store in an airtight container in the refrigerator.